Habitat: Cities, towns, farms, ranches, open woodlands, fields, and lawns. Ideal nesting habitat would include areas with trees or other structures. This is a short-tailed, chunky, iridescent black bird flecked with white in the fall and winter. It has a long pointed bill that is yellow in the summer and dull gray in the fall and early winter. Juveniles are a uniform dull gray with dark bill. Like the house sparrow, the starling was introduced from Europe in the 1890's. Since that time, they have increased in numbers and spread across the country. Starlings are well adapted to urban life which offer it an abundance of food and nesting sites. Starlings are very aggressive and will drive native birds out of their territory, much to the dismay of local bird watchers. Starlings are well noted for their flocking habits. They often gather in the tens of thousands, creating a nuisance when roosting in populated areas. 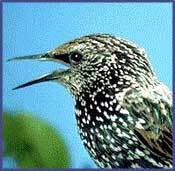 The starling sings various trilling melodies, clear whistles, clatters, and twitters. Hear It Now! Starlings rank just behind pigeons and sparrows as an urban bird pest. Starlings can be a nuisance in both urban and rural areas due to their nesting, eating and living habits. Starlings are frequently considered pests because of the problems they cause, especially at livestock facilities. Starlings may selectively eat the high-protein supplements that are often added to livestock rations. Starlings may also be responsible for transferring disease from one livestock facility to another. This is of particular concern to swine producers. Starlings cause other damage by consuming cultivated fruits such as grapes, peaches, blueberries, strawberries, figs, apples, and cherries. Large roosts that occur in buildings, industrial structures, or, along with blackbird species, in trees near homes are a problem in both rural and urban sites because of health concerns, filth, noise, and odor. In addition, slippery accumulations of droppings pose safety hazards at industrial structures, and the acidity of droppings is corrosive. Gutters and drainage pipes clogged with starling nests often backup, causing extensive water damage. The bacteria, fungal agents and parasites in the feces also pose a health risk. One of the more serious health concerns is the fungal respiratory disease histoplasmosis. Starling and blackbird roosts located near airports pose an aircraft safety hazard because of the potential for birds to be ingested into jet engines, resulting in aircraft damage or loss and, at times, in human injuries. Starlings roosting habits can be modified permanently using BirdNet netting and/or roost inhibitors like Sting-'Em bird gel and Bird Stop. For large flocks or agricultural applications, these birds can be moved with a well-timed, organized scare campaign using strategically placed ultrasonic and sonic audio systems like the BirdXPeller Pro and Super BirdXPeller Pro Sonic Repellers or QuadBlaster depending on the size of the area. These products combine natural and electronic sounds programmable species specific distress calls and predator sounds. Repelling is even more effective when combining audio with visual frightening devices that flash such as Irri-Tape, Terror Eyes holographic balloons or Prowler Owl. Bird Spikes work well to eliminate roosting spots on ledges and sills as does Shock Tape. See our complete list below of recommended bird deterrent products to repel starlings. A "synergy" or combination of bird repellent products typically offer the most successful solution for repelling starlings. For bird control solutions, we often recommend using companion products by combining electronic sonic repeller devices or bird hazers with visual scare deterrents, physical bird barriers or scent and taste aversion products. This kind of multi-sensory attack is extremely effective in deterring pest starlings for good!